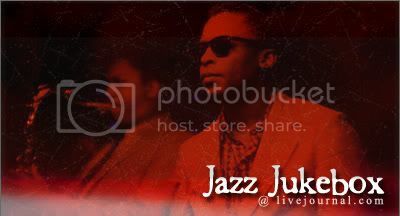 The Jazz Jukebox is an LJ community created by misanthropos as a way for all jazz fanatics alike to share great music and get exposure to more jazz artists. As this is a locked community, you will need to join in order to read posts. If you decide to become a member of this community, it would be nice if you could contribute occasionally as well. 1. If you decide to listen to the music featured in this community, please leave a comment in acknowledgment. 2. Do not re-post community posts or pass them off as your own elsewhere, unless you are the original poster. Leechers are not welcome. 3. Members, remember to lock your entries before posting! 4. Check the tags before asking for anything. What you're looking for may have already been uploaded. 5. Requests are allowed, but not guaranteed to be fulfilled. The RIAA states that once downloaded, you have 24 hours to remove a music file from your computer. I will not be held liable for what you decide to do with the music you find here. Do use this community to widen your horizons of jazz music, and support the artists you love and enjoy!